Every so often, my husband and I stumble across old pictures of us when we first moved to Hawaii (before kids and chaos, we like to say). And, we recently found a few pictures of a trip to the Big Island circa 1998, when a lava flow came so close to the parking lot that we could hike right to it. In fact, we remember poking the lava with sticks and watching coins spontaneously combust when they came in contact with the boiling hot liquid. To this date, that trip was one of the best vacations we ever took. Why all the narrative? Well, turns out, another lava viewing event in Hawaii is happening right now — and you have the opportunity to see it first-hand! Lava from Kilauea volcano’s Puu Oo vent is starting to spread out on the coastal plain of Hawaii Volcanoes National Park, a little more than 2 miles from the ocean. If you know your lava-types, you’ll know what aa lava is (fragmented, rough, and spiky when it cools). And, this is the type of lava that’s flowing currently, following several channels down the steep slope of the pali and slowing as the flow spreads on the flat ground of the plain, covering previous lava flows. Since the lava reached the bottom of the pali Wednesday afternoon, it has advanced about 492 feet on the plain. 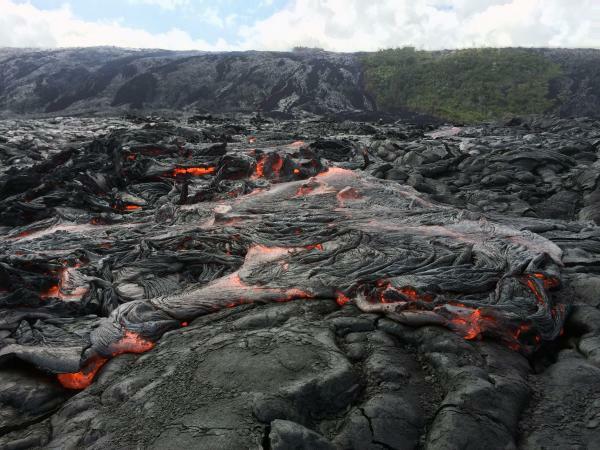 The closest viewing of the current flows is from the County of Hawaii Kalapana Lava Viewing Area off Highway 130 in Kalapana, near the eastern border of HAVO. The lava viewing area is open daily from 3 p.m. to 9 p.m.
From the park side, the easiest vantage point is at the end of Chain of Craters Road, past the Holei Sea Arch, where the pavement ends and before the gravel emergency access route begins. Staff and visitors have reported good views of lava streaming down the pali in the evening (6/30), but poor air quality at times due to volcanic gas. The park is open 24 hours a day. Volcanic gases are a danger to everyone, particularly to people with heart or respiratory problems and infants, young children and pregnant women. If air irritates, smells bad, or you have difficulty breathing, leave the area. Park rangers do not encourage visitors to hike out to the flows from either side. From the park side of Chain of Craters Road, it’s a grueling, 10-mile roundtrip hike over sharp, uneven lava rock terrain. All who attempt to reach the lava flows are urged to prepare ahead and bring plenty of water. Overnight camping on the flow field is prohibited. All overnight camping within the park must be in a designated campsite, and requires a permit available from the backcountry office or through Hawaii Volcanoes Lodge Company. The new gravel route is designated for emergency access only and the park does not encourage its use. Park rangers will continue to staff the end of Chain of Craters Road. The flow front reached the base of the pali yesterday, and over the past day has begun spreading out a short distance onto the coastal plain. 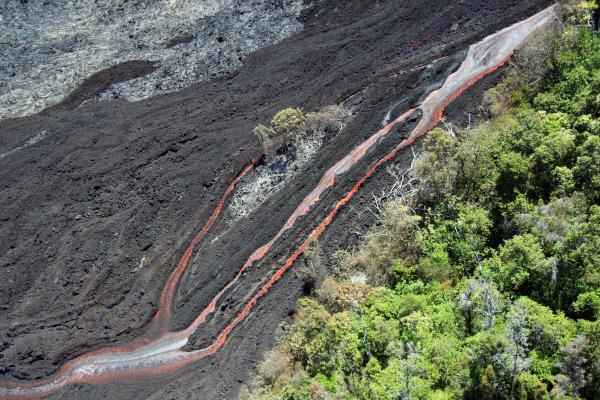 Channelized ʻaʻā remains active on the steep portion of the pali, with several parallel channels of swiftly moving lava. Of course, it may be best to get some help from the experts if you want the best lava-viewing experience. The good news is that Hawaii Aloha Travel has a whole host of ways to see the lava with an expert guide. If you book a Volcano Sightseeing and Walking Tour, make sure you ask your guide how best to view the spectacle! As for me, my lava memories are “burned” into my mind (pun intended) and will be forever. So, go ahead, and make your memories, too!